PONZU is a condiment made with Japanese soy sauce and vinegar. Made with naturally brewed Tokusen special grade Japanese Soy Sauce, this Truffle Ponzu features both the elegant flavor of truffles and the rick, umami taste of bonito. Best enjoyed with fresh vegetables and seafood. 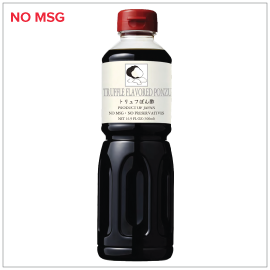 Ingredients: Soy Sauce (Water, Soybeans, Wheat, Salt, Alcohol), Vinegar, Mirin, Sugar, Sake, Water, Yuzu Juice, Bonito Extract, Truffle Flavor, Salt.